It is often noted that change takes time, specifically that it takes about 17 years for research findings to be consistently adopted as practice. We see that issue frequently in obstetrics, where it often takes longer. For instance, even though high quality research has shown for more than 20 years that routine episiotomies cause the very tears they were initially hypothesized to prevent, in many hospitals, episiotomy rates remain above 30%, with rates at some institutions being much higher (read more on episiotomy here). In considering VBAC, however, we can see that change can occur almost instantaneously–in one direction. The American College of Obstetricians and Gynecologists (ACOG) began recommending restricted use of episiotomy in 2006–more than a decade after research showed the risks of routine use–and many practitioners still aren’t on board. But when ACOG changed its recommendations regarding vaginal birth after cesarean (VBAC), the practice came to a screeching halt. ACOG has offered a series of recomendations on VBACs, beginning with Committee Opinions in 1988 and 1994, with Practice Bulletins following in 1995 (#1), 1998 (#2), 1999 (#5), 2004 (#54), and 2010 (#115). Dr. Hilary Gerber put together an excellent slide show explaining the changes in each set of recommendations, which you can view here. For most of the twentieth century, when lifesaving cesareans became a real option in hospital births, the common wisdom was “once a cesarean, always a cesarean,” a statement made professionally in 1916 at the New York Association of Obstetricians & Gynecologists. However, for the next 60 years, cesareans were so rare to begin with that the number of women undergoing repeat procedures was small. The overall cesarean rate in 1965 was under 5%. As primary cesareans became more common in the late 1970s and through the 80s, more and more women also underwent repeat cesareans, and by 1990 the overall c-section rate was almost 23%. At the same time, surgical techniques advanced to make VBACs safer, and in 1990 about 20% of women who had a prior cesarean had a VBAC. In 1994, ACOG issued a Committee Opinion that said that in the absence of contraindications (primarily classical incision in prior cesarean), women should be encouraged to undergo trial of labor after cesarean (TOLAC) rather than automatically being scheduled for a repeat cesarean. We know now that most women, especially those with only one prior cesarean, are good candidates for VBAC, and it is estimated that 70% of women undergoing TOLAC can have successful VBACs, but the next year, the VBAC rate was only 27%. While this was definitely an increase, it hardly indicated that all of the most appropriate candidates for TOLAC were actually going into labor. The VBAC rate peaked in 1996 at 28.3% and then began to decrease, driven by an article by Michael McMahon et al that linked TOLAC to an increase in maternal complications. VBAC should be attempted in institutions equipped to respond to emergencies with physicians immediately available to provide emergency care. This recommendation was Level C evidence, meaning it was based on clinical opinion, not research trials. Level A evidence, the level with the highest quality research to back it, still stated in the same bulletin that most women with prior cesareans were good candidates for TOLAC. The problem with the immediately available standard is that most smaller hospitals can’t meet it. They may not have an anesthesiologist in house 24/7 or enough OBs that there is necessarily one standing by on the ward, ready to perform surgery. Even large hospitals may not meet this standard if they cannot guarantee that the available doctors will not be busy with other patients. The standard was not specifically defined, and rather than be concerned that they weren’t meeting it, many hospitals simply stopped offering TOLACs, requiring patients who had previous cesareans to schedule a repeat surgery. The line that ends at the top is the overall cesarean rate. 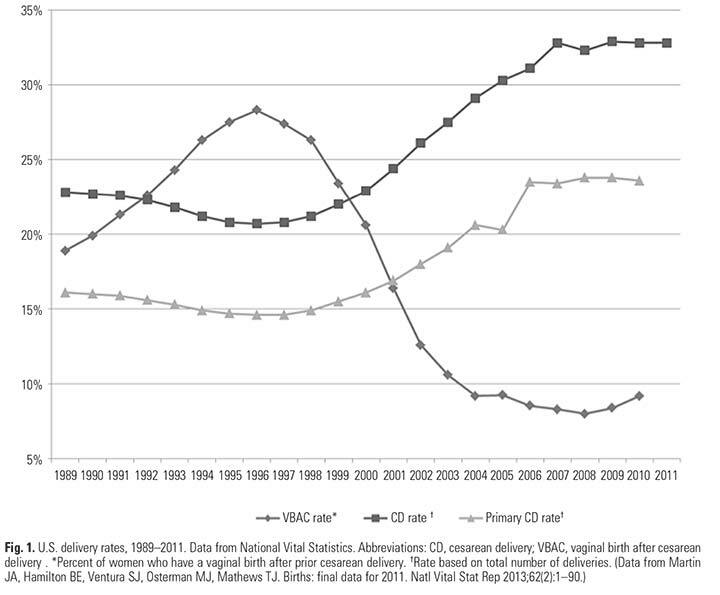 The line that ends in the middle is the primary cesarean rate, and the line that ends at the bottom is the VBAC rate. 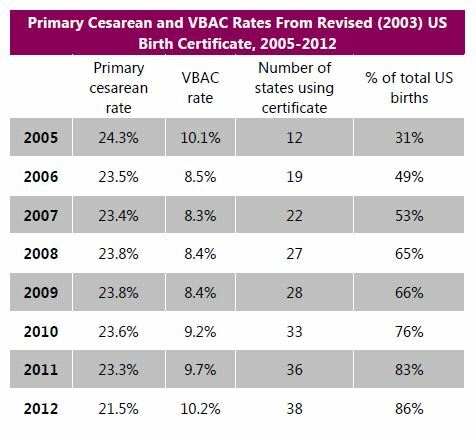 In the mid 1990s, the VBAC rate was higher than the overall cesarean rate, but within a year of the 1999 guidelines, VBAC rates were down to what they had been in 1993, the year before less restrictive guidelines were initially recommended. But it didn’t stop there. The rate just kept decreasing. Given the onerous medical liability climate for ob-gyns, interpretation of ACOG’s earlier guidelines led many hospitals to discontinue VBACs altogether. Our primary goal is to promote the safest environment for labor and delivery, not to restrict women’s access to VBAC. The new guidelines stated not only that most women with a prior cesarean were good candidates for VBAC, but that many women with two prior cesareans were as well. The rates rose a tiny amount, and remain about half of what they were in 1990. In 2014, AGOC issued a consensus statement about preventing primary cesareans. This publication pointed out some of the risks of cesarean over vaginal birth, including a tripling of risk of maternal death. While some hospitals and doctors have gradually become more receptive to VBAC and have lifted out-and-out bans, some hospitals have instituted new bans since the 2010 and 2014 guidelines were released. Attempting a VBAC is comparable in risk to standing your older child out in the middle of a busy highway and hoping she doesn’t get hit by a semi. Maybe the odds of her being hit are low, but you wouldn’t take that risk with your other child, so I don’t understand why you’re willing to risk your unborn baby’s life. I don’t know where you got the *delusion* that you could VBAC, there was a law that was passed against VBAC’ing after more than one cesarean. A VBAC is like *jumping off a bridge* in which mortality is close to 90% with a uterine rupture! In contrast to frank uterine rupture, uterine scar dehiscence involves the disruption and separation of a preexisting uterine scar. Uterine scar dehiscence is a more common event than uterine rupture and seldom results in major maternal or fetal complications. When VBACs were recommended as safe in 1994, the rate slowly crept up, reaching over 28% in 1996. The rate began to go down in 1997 in response to a single article, even before recommendations were issued by ACOG. When the “immediately available” standard was introduced in 1999, the rate plunged to its pre-1994 level within a year. 10 years after the “immediately available” standard (level C) was introduced, the rate was 8.4%, even though the Level A recommendations still said that most women were good candidates for TOLAC. Two years after less restrictive standards were introduced in 2010, the VBAC rate had inched up less than 2 percentage points, to 10.2%. Many hospitals have continued their de facto VBAC bans, some hospitals have introduced new bans, and many physicians still refuse to perform VBACs. The problem is (as others have also pointed out), why are hospitals not ready to perform an emergency cesarean? Isn’t that the whole reason to birth in a hospital–that they are prepared for emergencies? Uterine rupture is not unique to VBAC–it can happen as a result of any number of complications, including labor inductions. A hospital that is not equipped to support a TOLAC is not set up to support birth emergencies. Myth: If your hospital doesn’t offer VBAC, you have to have a repeat cesarean. If your hospital does not support VBAC, ask them why they are not properly equipped and staffed to perform emergency cesareans. Then go elsewhere.